Housebound is a thriller-comedy from New Zealand that’s put together way better than anything you can get from Hollywood. Housebound was another one of those 11:30-at-the-Rio films I wanted to check out. It was my first of such. Glad I saw it. Very funny and entertaining. Kylie Bucknell attempts to commit a robbery on an ATM. The robbery doesn’t work out as her partner is knocked out and she totals her getaway car thanks to driving fast over a big speed bump. The judicial system decides the best thing for her would be house arrest at her mother Miriam’s house. It seems like the right choice to do but the house is old and leaves Kylie with an eerie feeling. Kylie’s feelings are justified when she hears Miriam call into a radio show talking of how weird it is around there. Then Kylie gets a taste of the eeriness as she notices things like an animated stuffed toy suddenly coming to life and even an old Motorola phone ringing out of nowhere. Even a dental partial has her suspicious. Kylie tries to alert authorities and others but they won’t believe her. Guests and other neighbors around the house are actually pleased at the possibility of a ghost. Nevertheless Kylie and Miriam are persistent. The only one who believes her is Officer Grayson who knows of past incidents associated with this house such as this being a halfway house for young offenders. In fact the first person who’s the prime suspect in all of this is their shady neighbor. Despite his nasty attitude, he doesn’t register as a positive. However things become more suspicious when a friend of Miriam’s appears suspicious. Eventually the murderer is solved but not without an eerie chase. For a horror-comedy like that to fly, it had to be done with the right acting, the right direction, and the right story. There have been horror-comedies done before but they would mostly come across as looking ridiculous in the end. Even Hollywood can get it wrong sometimes. This film got it right. From the start with a clumsy robbery attempt to the sense of something wrong in the house to the moment of climax at the end, it was done right. Even the parts intended to be dramatic didn’t come across as ridiculous nor did it dip into sentimentality that was too sappy. Looking back, it would be hard for me to see where the movie did things wrong. Even in terms of the gore, the film didn’t overdo it and it did its most gory part at the right time. I will admit there were some parts that left me confused about what was happening. However they’d make sense in the end. Simply this is a movie that shouldn’t be taken too seriously. Its intent was to deliver a humorous thriller/horror story and it came across as way better than something Hollywood would do. It even had excellent balance between the dramatic parts and the humorous parts. If it didn’t, it would look ridiculous. I would have to watch over and over again to see if it made a false note. Even the death of the perpetrator didn’t come across as ridiculous despite it actually being a ridiculous death. The comedic acting was just right in order to make this movie work. Morgana O’Reilly needed to deliver a protagonist character that had dimension despite having one that could come across as wooden. Instead she did a good job with Kylie and it came across very well. Rime Te Wiata was the show-stealer as the mother. Her role as the mother added to the comedy to the film thanks to the excellence of the performance. The male actors also did a good job in their roles despite being the supporting players. This is Gerard Johnstone’s first feature -length film and it’s an excellent finished product. Very entertaining and very professional. Another great thing about the script is that it didn’t deliver an awful lot of one-liners and instead delivered more on situational comedy. That worked for the better in this movie. 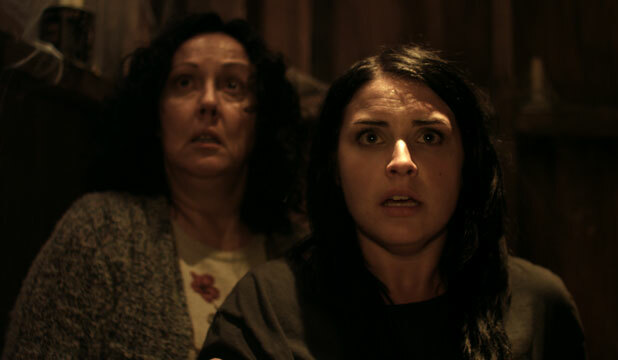 Housebound is an excellent horror-comedy that both keeps you intrigued and makes you laugh without having ridiculous moments like so many other horror-comedies are prone to do.